Recently I tried to describe the Belinjau fruit to a colleague. I said it was an edible fruit turning from green to yellow to red. He asked, “What’s the name of the fruit?” and I said, “belinjau”. He responded with, “Oh! you mean ‘berinjal’ “. I then explained that belinjau and brinjal (egg plant) are 2 very different fruits. Below is a picture of the belinjau. described in the popular book, “Growing at your Doorstep” by Hugh Tan of NUS. 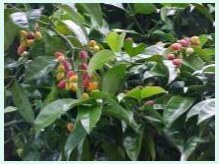 The belinjau fruit is made into a popular tidbit, belinjau keropokor belinjau empeng, available from most sundry shops. I hear that it goes very well with beer. Not being a beer drinker, though, I can’t vouch for that. Incidentally, thinking about the confusion in hearing the words ‘belinjau’ and ‘berinjal’ reminds me of the airlines tragedy in Taiwan where the pilot was confused between Runway 5R and Runway 5Lin hearing the instructions from the airport’s control tower for take-off during heavy rain.